I was fortunate to receive a copy of Leslie Albrecht Huber's The Journey Takers for review. The title is appropriate, for it follows the paths of four of Huber's paternal ancestors as they journey from their respective homes in Germany, Sweden, and England to their new lives in America in the nineteenth century. But it's much more than that. Throughout the story, Huber interweaves the story of her own journey as a young woman, first as a college student, then a newlywed, and finally as a young mother struggling to make sense of her ancestral history as it relates to the present. The author had some amazing opportunities of which most genealogists can only dream: visiting and doing on-site research in her ancestral locations in Europe. Along the way, she researches the history of each region, outlining the factors which ultimately led to the immigration of her journey-taking ancestors. Using original and microfilmed documents, Huber goes back to the earliest ancestors she can trace in these communities, telling their stories. She fills out the foundation of local and family history with fictional scenes of her ancestors' lives, imagining the impact of events and the likely resulting actions and emotions. She details the sacrifices and hardships the journey takers endured as they sought their destination: a new Zion where they could worship and live as they saw fit. Zion is not a place --it's a state of being, a frame of mind, a feeling within. It's a belief in something beyond one's self, a devotion to a greater cause. Zion is not a destination. It is a journey. Family historians will benefit greatly from this title for a variety of reasons. The depth and scope of research required to create a quality history of Huber's ancestors' lives is marked. The careful documentation and source citations are to be applauded. Creating a realistic and sequential narration out of the bare bones of facts is to be commended. To be able to research, analyze and synthesize the details of family historians' ancestors in such an interesting and valid manner is something to which we all should attain. Huber's book is a strong example of a fascinating story married to a quality researched work and as such would be a excellent addition to any genealogist's personal library. 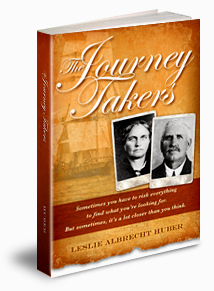 The Journey Takers by Leslie Albrecht Huber, published in 2010 by Foundation Books; 321 pages. Available at bookstores and online at websites such as Amazon.com ($19.95 most places; $19.07 at Amazon). Disclosure: I received a free book from Ms. Huber for review. As an Amazon Associate, I receive a small percentage of the purchase price when readers purchase a title through the Amazon link above, although this title is available at other websites and various bookstores.